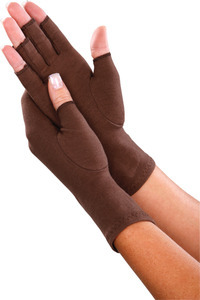 for Home or Commercial Sewing Cutting, Support, comfort and relief for active hands! Made from a seamless, lightweight, soft cotton/ Lycra compression knit for a snug fit that warms & supports the hands during crafting activities. The unique design helps improve circulation, reduce swelling & relieve arthritis pain. The open fingers allow full freedom to feel & grip all day. Washable for easy care. Sold in pairs. Size: Small. Color may be Brown or Green.